Taking a vacation to Greece has long been at the top of many traveler’s bucket list. Visit magical Mykonos, Greece and stay at the luxurious Alegria villa. It’s time to treat yourself and enjoy an unforgettable, Greek getaway. The Alegria villa in Mykonos, Greece is a luxury property that includes 13 en suites. Therefore, this luxurious villa can accommodate up to 30 people. It’s perfect for large family gatherings or a fun time with your closest friends. This luxurious villa offers privacy, yet close to all the vibrant, cosmopolitan activities in Mykonos, Greece. You can find the Alegria villa on the island of island Kalo Livadi & Kalafatis. The property sits upon 7,000 sqm of land between two fabulous beaches. Relax, unwind and take in stunning sea and sunrise views. Alegria villa actually consists of two side-by-side buildings, each 1,500 sqm in size. As a result, this unique accommodation provides multiple uses, from private getaways to large social events. Providing plenty of room, the villa’s 13 rooms and suites provide a variety of accommodation options. Included are five suites. There are four Executive suites, as well as a romantic Honeymoon suite. The Executive suites each come with a private jacuzzi and bathtub. The Honeymoon suite features a jacuzzi on a private terrace. How romantic is that? Algeria villa includes a modern gym overlooking the Aegean sea and spa room. There are two sheltered dining and lounge pergolas. Enjoy unlimited sea views. Outdoors, take dip in the large infinity lake shaped swimming pool. You can also soak in the jacuzzi. The pool lounge comes equipped with a BBQ to treat your guests to fantastic outdoor dining. In addition, the garden event area is able to hosts almost 700 people. The quaint chapel is perfect for that memorable wedding. Your affluent guests can take advantage of the helipad for seamless arrivals and departures. Guests staying at a luxury villa like this, expect luxury amenities. Yo won;t be disappointed. Alegria villa provides – first class 24/7 concierge service, Gym Use 24/7, general estate cleaning and daily housekeeping services, movies/music/book library, and wine cellar facilities. Upon your arrival and departure, you will receive a welcome & farewell package. 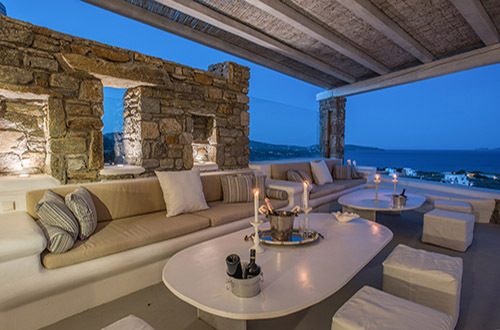 A stay at the luxury Alegria villa in Mykonos, Greece will be memorable. It’s a VIP experience you don’t want to miss. With beautiful surroundings, privacy and luxury accommodations, it’s a must. The Life of Luxury can help you plan and book your trip to Mykonos, Greece and stay at Alegria villa. We offer a variety of luxury travel services. Read more stories in our luxury blog. It’s a big world and there is so much to discover.